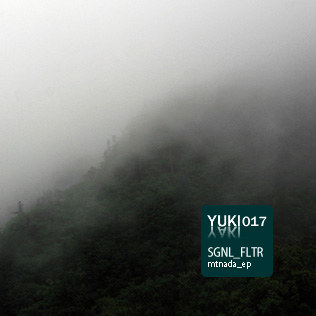 'The tracks are the result of a certain mood, idle hands and an empty head - and this is probably reflected in them' states Danish producer Danny Kreutzfeldt about his first EP for YukiYaki. Perfectly right! This Electronicaesque composed of fine cut Ambient sound imagery and IDM and Minimal House grooves does not require a huge philosophical backdrop behind each and every sonic transient. Under typical music-industrial circumstances four gloomy tracks named after Mesopotamian deities might have conjured up a lot of interpretations. But in this case we may just let the pictures arise in our audio-visual cortex without too much higher brain activity. Though there is still some space for a little bit of brain juggling. For Danny himself 'Mount Nada' - as the EP’s title is pronounced correctly - plays with a little paradox: What exactly is a 'Mountain Of Nothing'? Sgnl_fltr was founded in 2003 by the Dane Danny Kreutzfeldt and was active until 2008. Kreutzfeldt has made and released music under different names in a wide range of styles including ambient dronescapes, isolationist dub and shredding speedcore, but always with the same detached and intense atmosphere to it. Under the Sgnl_fltr guise, Kreutzfeldt has worked on the deconstruction of rave music into slower, soundier or more abstract shapes. This work has taken place on three acclaimed albums on the dutch Databloem label as well as various compilation, remix and netlabel contributions. The eclectic netlabel Drowning and the netlabel experiment Periskop.